Dale of Norway OLMYPIC PASSION has designed official sweaters for every Winter Olympic and World Ski Championship event since the 1956 Cortina Winter Olympic Games. Since 1956, Dale of Norway has been the official supplier to the Norwegian Ski Association – and later to the International Olympic Committee. Norwegians are said to “be born with skis on their feet”. 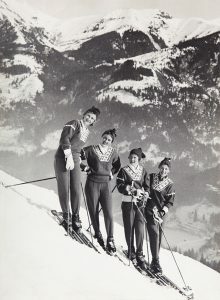 During long winters with snow, skiing has not only been popular for sport and fun, but it is also used to travel to areas where no vehicles can drive. It is no surprise that skiing is the national sport in Norway and that ski athletes are the true heroes. Since Dale of Norway is an integral part of Norwegian history and culture, the cooperation with the National Ski Association is a natural fit. Since 1956, Dale of Norway has been outfitting the national Norwegian ski team with official sweaters for all Winter Olympic Games and World Championships. Dale of Norway was later chosen to design the official sweaters for the Winter Olympic Games through the International Olympic Committee (IOC), with the rights to use the Olympic rings. This made the Dale of Norway sweaters even more exclusive.